An integral part of the New York Knicks during the title runs of the 1970s, Willis Reed is considered by many to one of the best NBA players in history. The Hall of Fame big man spent his entire career with the Knicks and Willis Reed cards maintain solid interest. Shop for Willis Reed Cards on eBay. 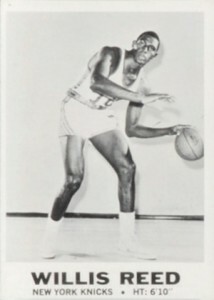 After a college career at Grambling State, Willis Reed was a second-round pick by the New York Knicks in 1964. 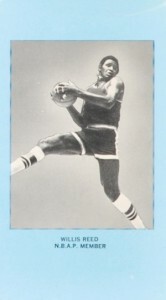 While injuries cut his career short, Willis earned seven consecutive All-Star appearances and a league MVP award in 1970. He also helped the Knicks claim their only two NBA titles, winning the Finals MVP in both 1970 and 1973. 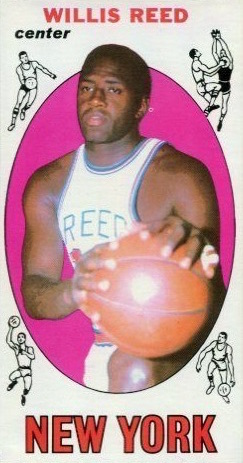 Because of the period when he made his debut, the earliest major card release for Willis Reed came five years into his NBA career. A few limited options pre-date his official rookie card. Pack-pulled autographs for Reed first arrived in the 1990s and have been relatively common since then. Despite his relevance to the game, signed Willis Reed cards are undervalued and can be regularly found for as low as $15 or less. Part of a test release from Topps, it is not all that common to come across the earliest NBA card for Willis Reed. Despite never being officially issued by Topps, limited copies of the 1968-69 Topps Test card for Willis entered the market with the others from the 22-card set. While the the removal of logos and team names likely indicates this was not an officially licensed release, the oddball option for Willis Reed is still notable as an early vintage card. Along with the images used, the sizing of the actual cards was inconsistent and the card for Reed features more of the blue border than other players in the set. Willis Reed's official rookie card is found in the landmark 1969-70 Topps tallboy product. Loaded with Hall of Fame talent given the gap in official NBA products during the 1960s, Reed is not the most desirable rookie option but still very relevant to collectors. Like many of the cards in the set, Reed is shown with his jersey backwards. This is likely due to licensing issues. Although ungraded and low grades of the 1969-70 Topps card go for as little as $10, high-graded copies can approach $1,000. More poster than card, the sole insert in 1969-70 Topps mimics a ruler and includes a cartoon image of Willis Reed. Although the measurements are obviously not to scale, the "card" is just under ten inches tall.